The annual gingerbread house sits in the State Dining Room at the White House in Washington, DC. Which one is better: the White House or Buckingham Palace? 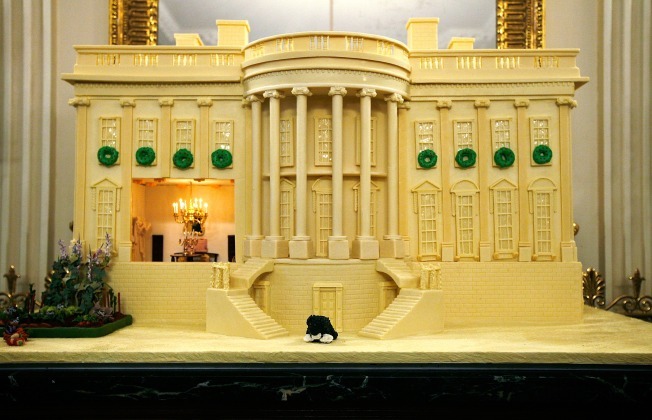 Find out at the 3rd annual Gingerbread White House contest, where you can vote for your favorite gingerbread models of both the White House and Buckingham Palace, created by children ages 14 and under. On display at the National Constitution Center from Dec. 26 through Jan. 1, there will also be a special presentation on the similarities and differences between White House holiday traditions and the winter celebrations at Buckingham Palace. And whilst you're learning something new, the kiddies can make their own tiaras and beefeater hats at the craft activity tables too. Admission is free, sort of. Buy tickets for the museum at 525 Arch Street -- $12 for adults, $11 for seniors, $8 for children ages 4-12 (and free for those 4 and under) -- to see the display and participate from 11 a.m. to 3 p.m.